I’m having a bit of a ‘primer’ moment. There are no less than three primers that I am using as a regular part of my day to day make-up routine. Yes, I realise that is excessive, but they each do something unique to make the rest of my make-up look that little bit better. Of the three, I have reviewed the first two, but as a reminder. The No7 is fantastic for mattifying skin, so I’m using this on my nose and forehead to prevent the dreaded oil slick. The L’Oreal Studio Secrets Resurfacing Primer is amazing for making fine lines vanish under my eyes and minimise pores. The third primer is a new addition to the routine, hence this review. I have added this to help combat winter dullness and keep skin glowing and healthy looking. This pink primer is light and comes in a prit-stick like package, with a twist-up base to dispense the product gradually. The pale pink shade adds a subtle warmth to skin and some radiance without being pearly or shiny. The effect is subtle, as with most primers, but it does create the perfect base for foundation. I can only comment on how it works for my pale skin, but I would be interested to hear how this works for darker skin shades? What do I like about this primer? It’s light, so doesn’t feel like I am ‘caking’ on my make-up. It smells nice, with a hint of vanilla. It is a healthy looking base for make-up. The packaging isn’t as cute as most of the Benefit range. It’s a little bit basic and a tad cheap looking. The effect is so subtle that it’s pretty much invisible, so I can’t take pictures to show! It’s one of those products that the affect is probably in my head more than actually on my skin. The million dollar question – would I repurchase? Probably not. Of all the Benefit products I own, this isn’t the most mind-blowing. I would be happy to just skip this step in my make-up routine. It’s a nice addition, but not an essential. This product was sent to me for the purposes of a review. I did NOT buy this item with my own money. All reviews are honest and impartial, regardless of the source of the product. I agree with you completely. 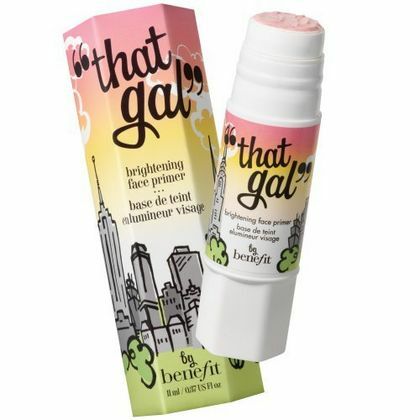 I am a self-proclaimed Benefit addict but even though I loved the way That Gal was scented, it was not worth $28– for less than an ounce? Like you, I own a few primers that I alternate during the week and I’ve had more luck with MAC’s Prep+Prime and Lancome’s La Base Pro base. Both are wonderful.